"It really will be a new world, biologically, at that point," warns Anthony Barnosky, professor of integrative biology at the University of California, Berkeley, and lead author of a review paper appearing in the June 7 issue of the journal Nature. "The data suggests that there will be a reduction in biodiversity and severe impacts on much of what we depend on to sustain our quality of life, including, for example, fisheries, agriculture, forest products and clean water. This could happen within just a few generations." The paper by 22 internationally known scientists describes an urgent need for better predictive models that are based on a detailed understanding of how the biosphere reacted in the distant past to rapidly changing conditions, including climate and human population growth. In a related development, ground-breaking research to develop the reliable, detailed biological forecasts the paper is calling for is now underway at UC Berkeley. The endeavor, The Berkeley Initiative in Global Change Biology, or BiGCB, is a massive undertaking involving more than 100 UC Berkeley scientists from an extraordinary range of disciplines that already has received funding: a $2.5 million grant from the Gordon and Betty Moore Foundation and a $1.5 million grant from the Keck Foundation. The paper by Barnosky and others emerged from the first conference convened under the BiGCB's auspices. "One key goal of the BiGCB is to understand how plants and animals responded to major shifts in the atmosphere, oceans, and climate in the past, so that scientists can improve their forecasts and policy makers can take the steps necessary to either mitigate or adapt to changes that may be inevitable," Barnosky said. "Better predictive models will lead to better decisions in terms of protecting the natural resources future generations will rely on for quality of life and prosperity." Climate change could also lead to global political instability, according to a U.S. Department of Defense study referred to in the Nature paper. "UC Berkeley is uniquely positioned to conduct this sort of complex, multi-disciplinary research," said Graham Fleming, UC Berkeley's vice chancellor for research. "Our world-class museums hold a treasure trove of biological specimens dating back many millennia that tell the story of how our planet has reacted to climate change in the past. That, combined with new technologies and data mining methods used by our distinguished faculty in a broad array of disciplines, will help us decipher the clues to the puzzle of how the biosphere will change as the result of the continued expansion of human activity on our planet." One BiGCB project launched last month, with UC Berkeley scientists drilling into Northern California's Clear Lake, one of the oldest lakes in the world with sediments dating back more than 120,000 years, to determine how past changes in California's climate impacted local plant and animal populations. City of Berkeley Mayor Tom Bates, chair of the Bay Area Joint Policy Committee, said the BiGCB "is providing the type of research that policy makers urgently need as we work to reduce greenhouse gas emissions and prepare the Bay region to adapt to the inevitable impacts of climate change. To take meaningful actions to protect our region, we first need to understand the serious global and local changes that threaten our natural resources and biodiversity." 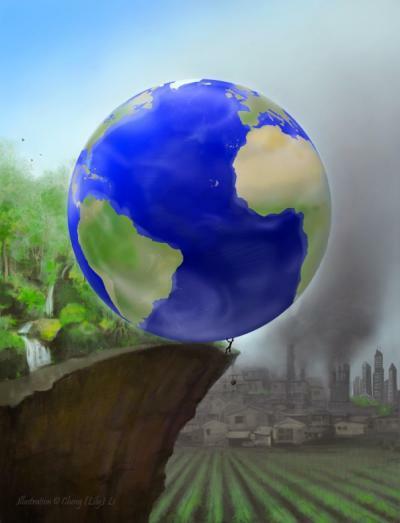 The Earth may be approaching a tipping point due to climate change and increasing population. "The Bay Area's natural systems, which we often take for granted, are absolutely critical to the health and well-being of our people, our economy and the Bay Area's quality of life," added Bates. "We really do have to be thinking about these global scale tipping points, because even the parts of Earth we are not messing with directly could be prone to some very major changes," Barnosky said. "And the root cause, ultimately, is human population growth and how many resources each one of us uses." Coauthor Elizabeth Hadly from Stanford University said "we may already be past these tipping points in particular regions of the world. I just returned from a trip to the high Himalayas in Nepal, where I witnessed families fighting each other with machetes for wood – wood that they would burn to cook their food in one evening. In places where governments are lacking basic infrastructure, people fend for themselves, and biodiversity suffers. We desperately need global leadership for planet Earth." "Can it really happen? Looking into the past tells us unequivocally that, yes, it can really happen. It has happened. The last glacial/interglacial transition 11,700 years ago was an example of that," he said, noting that animal diversity still has not recovered from extinctions during that time. "I think that if we want to avoid the most unpleasant surprises, we want to stay away from that 50 percent mark." "Ideally, we want to be able to predict what could be detrimental biological change in time to steer the boat to where we don't get to those points," Barnosky said. "My underlying philosophy is that we want to keep Earth, our life support system, at least as healthy as it is today, in terms of supporting humanity, and forecast when we are going in directions that would reduce our quality of life so that we can avoid that." "My view is that humanity is at a crossroads now, where we have to make an active choice," Barnosky said. "One choice is to acknowledge these issues and potential consequences and try to guide the future (in a way we want to). The other choice is just to throw up our hands and say, 'Let's just go on as usual and see what happens.' My guess is, if we take that latter choice, yes, humanity is going to survive, but we are going to see some effects that will seriously degrade the quality of life for our children and grandchildren."